Bryan Henry walks us around the ALL-NEW, 2019 RAV4 at Glacier Toyota. Check out all the great new features, including 8 speed transmission and terrain select. 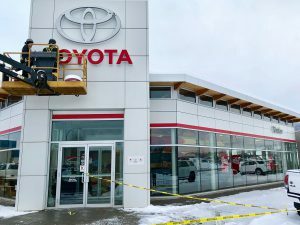 All RAV4s feature Apple CarPlay. 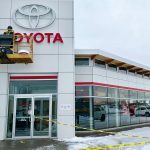 Glacier Toyota has had our signage refreshed. 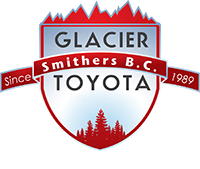 The lettering has changed slightly, but most noticeable, is the use of the chrome Toyota logo. This change over is being done world wide. Our pylon sign on Tatlow Road has been updated too. The 4th Festival of Trees was another great success. Thanks to our sponsors, and our community, we raised $35,003.25 for our two charities! 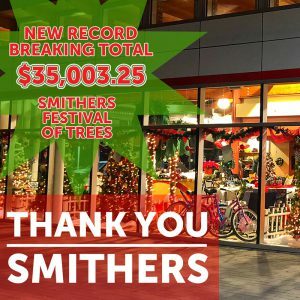 The Smithers Festival of Trees has now raised $90,196.75 for the Bulkley Valley Child Development Centre and the Smithers Salvation Army. Thank you! Not too far from Telkwa is the road to Top Lake. It requires off-road capability and a willingness to get your paint scratched.